Patrons and friends outside the Tomales Town Hall Branch library c. 1930s. Photo: Ella Jorgensen; courtesy Tomales Regional History Center. 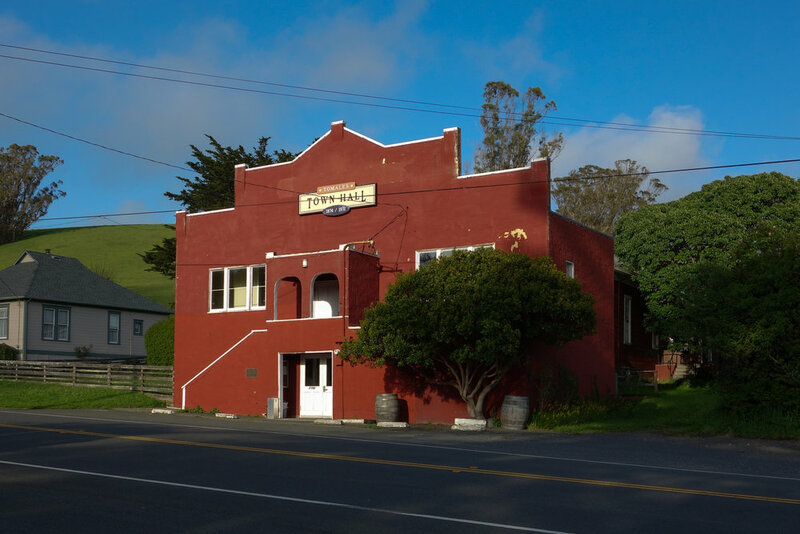 The Tomales Town Hall has been at the center of civic life in Tomales for almost 150 years, encouraging community involvement through a wide variety of gatherings. Over that time it has undergone major and modest changes, largely through the efforts of volunteers. The Hall has been host to meetings of fraternal organizations, 4-H Clubs, and numerous civic groups, weddings and wakes, birthday and anniversary celebrations, dance classes, art shows, movie screenings, Halloween Balls, and fundraising events of all kinds. From pioneer days to the present, countless voices have been raised in the Hall at hundreds of town meetings. Built by the early settlers in 1874, the exterior was originally simple and barn-like. But inside the ceiling was arched, the walls were paneled, and daylight entered by rows of double-hung windows on the south and north elevations. The stage was, if not original, added within a few years. Each of these elements remains intact today. 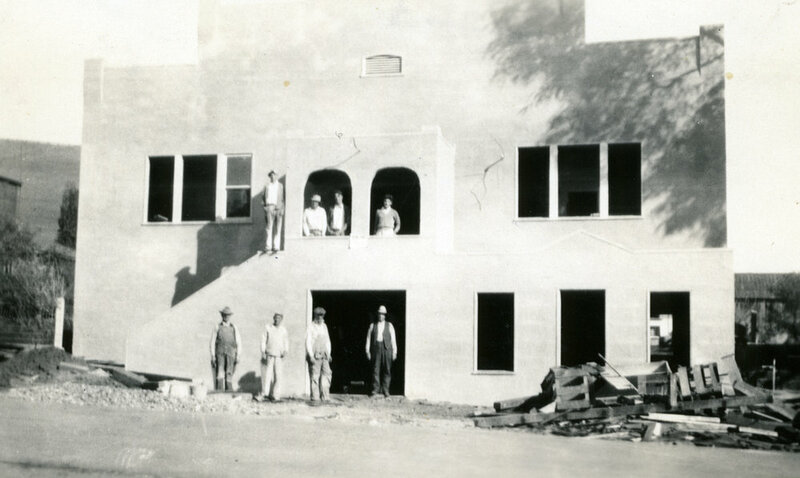 In 1931 the Hall was enlarged and remodeled, mostly by the volunteer labor of local men. The ground-level space was dug out to make room for a kitchen and public library in the basement. A Mission Revival-inspired 12-foot-deep facade was added to make room for bathrooms and an anteroom upstairs. One of the oldest continually used community buildings in California. the Hall's simple, multi-layered architecture reflects its long and practical history and the always-evolving spirit of its community. Click on photos to open them in 'lightbox' view (full screen). (1) WWI ROTC soldiers 1917 in front of original Hall. Photo: Ella Jorgensen; courtesy Tomales Regional History Center (TRHC). (2) Nearing the end of the 1931 remodel. Photo: Ella Jorgensen; courtesy TRHC. (3) Tomales Town Hall c. late 1970s. Photographer: unknown. (4) Tomales Town Hall, June 2017. Photo: Laura Trippi. This iconic painting of the Tomales Town Hall was donated by local artist Kathryn LeMieux to help kickstart a new era of renovations in 2005. As we approach our 150th anniversary, these efforts have shifted into high gear. Please join Kathryn and other generous donors and support the Hall's rejuvenation. Contribute what you can! Three women on Maine Street in Tomales c. 1920. Photo: Ella Jorgensen; courtesy Tomales Regional History Center. Tomales is a rural village in the northwest corner of Marin County, California. It sits in a small valley among rolling hills of grazing land. The Pacific Ocean, four miles west, often results in a strong marine presence here. The town is home to two churches, a history museum, an elementary school, and the Shoreline School District's only high school. Its built environment is rural in feeling and small of scale, much of it dating from the late nineteenth century. The setting and the simple vernacular architecture lend Tomales a strong sense of place and time. The Town Hall serves a wider community of five neighboring villages in Marin and Sonoma counties connected by CA State Highway One: Marshall, Tomales, Dillon Beach, Fallon, and Sonoma County's Valley Ford. Costumed Halloween Ball revelers c. 1970s. The Tomales Town Hall is governed by a Board of Trustees made up of members of the community. To join the board, a prospective member must first attend two consecutive meetings. Following that, the board votes on whether or not to invite that person to join. Officers are voted on by the board once a year. The current board consists of: Mark Hanreich (president), Venta Leon (vice president), Yola Simon (secretary), Robert Lawson (treasurer), George Magan, Alex Marcotte, and Liz Cunninghame. We welcome new members! Meetings of the board are held on the first Wednesday of every month: 8 pm during the summer (April to November). We truly love it when people come to our meetings, but they hardly ever do. It makes it a lot more fun. The mission of the Tomales Town Hall is to support projects that will benefit the community culturally and educationally, to encourage participation by this community, and to preserve and respect the building and its history. Barn dance at the Tomales Town Hall c. 2007. Banner (top): Postcard image of Tomales looking south c. 1900s. Courtesy Tomales Regional History Center.